Hi I am Arnold Greyling from Johannesburg in South Africa. This is my peer review assignment for week 1 of the Introduction To Music Production course at Coursera.org. I will be showing you how to record an acoustic instrument in a typical home studio. A Samson C2 condenser microphone. 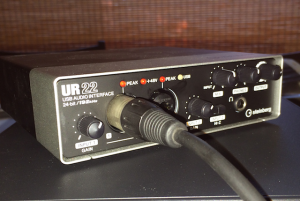 A Steinberg UR22 USB audio interface. Garageband a Digital Audio Workstation (DAW) that Apple supplies free to Mac users. This Howto will focus on setting up the equipment rather than the final recording and processing using the DAW. Acousting guitars often have built in pickups. You can record the guitar using the output of its pickup but very often the pickup quality is very low or the quality deteriorates as the battery runs down. If you do use the guitar pickup it is recommended to use a Direct Input box to connect the pickup to the audio interface. If the guitar does not have a built in pickup or if you are recording another instrument for example a saxophone you must use a microphone. 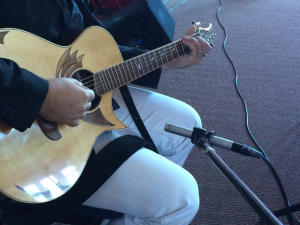 Even if the guitar has a pickup you may find that using a microphone produces better results. You can use any type of microphone but you will get better results if you use a condenser microphone with a reasonably flat frequency response. In this howto you will see a Samson C2 microphone. One disadvantage of a condenser microphone is that it needs phantom power. 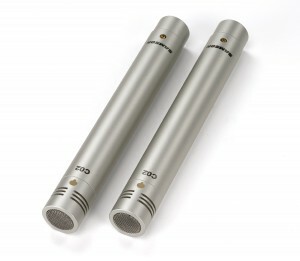 If your audio interface does not supply phantom power you can use a dynamic instrument microphone like the Shure SM57. Before you start make sure that all batteries (guitar pickup, notebook computer) are new or fully charged. First connect your computer to the audio interface with a USB cable. The USB cable also supplies power to the audio interface. Start your DAW on the computer and make sure that it recognises your audio interface as an input. If you (or the musician) wish to monitor what you are recording while you record you can either use monitor speakers or headphones. Connect the monitors as early as possible in the signal path. The UR22 audio interface has line level outputs as well as a headphone output. If you are using monitor speakers you can connect the UR22 line outputs to your amplifier inputs. If you want to use headphones simply plug them into the headphone output. I prefer using headphones unless the musician feels uncomfortable using headphones. If you do not have outputs on your audio interface you can use the DAW output on you computer for monitoring. Bear in mind that the DAW will add some delay in the signal. If the delay is too large it will be heard and make life very difficult for the musician. Next, connect the guitar pickup or the microphone to the the audio interface. For the pickup you will use an instrument cable and for the microphone you will use a XLR cable. If you use a condenser microphone switch on the phantom power, on the UR22 the switch says 48V. Turn down all input levels specifically the inputs on the audio interface before you connect your cables. This prevents loud thumping noises from your monitor speakers. Rear panel of the UR22 showing the line outputs and the switch for the phantom power. If you use a microphone place it as close as possible to the guitar without interfering with the musician’s movements. If you are using speakers for monitoring make sure that the microphone picks up as little as possible of the speaker sound. The Samson C2 and many other condenser microphones have a super-cardioid pickup pattern. This means that the microphone is uni-directional but has a region right behind the microphone that also picks up the sound at a high level. Do not put your monitor speakers right behind the condenser microphone, but rather at about a 45 degree offset. When everything is connected set your recording levels. Ask the musician to play some music to set the levels. The first place to set your levels is on the audio interface. Some audio interfaces have a proper level meter but the UR22 only has LEDs indicating that the signal is too high. If you do have an interface with a proper level meter set the level that the loudest parts of the music is just below 0 dB. On the UR22 set the level to a point where the peak LED starts flashing then turn it down slightly until the LED just stops flashing. Repeat the same process to set the levels in your DAW. Most level indicators use a coloured display. Green normally means OK, yellow means getting too high and red means too high. Your level should be in the high green and occasionally in the yellow when the music is at its loudest. You can now start recording by pressing the record button in your DAW. In most cases you will do more than one take. Between takes you can make adjustments for example: change your microphone placement to influence the sound or maybe change levels or maybe the musician missed a note and wants to fix it. 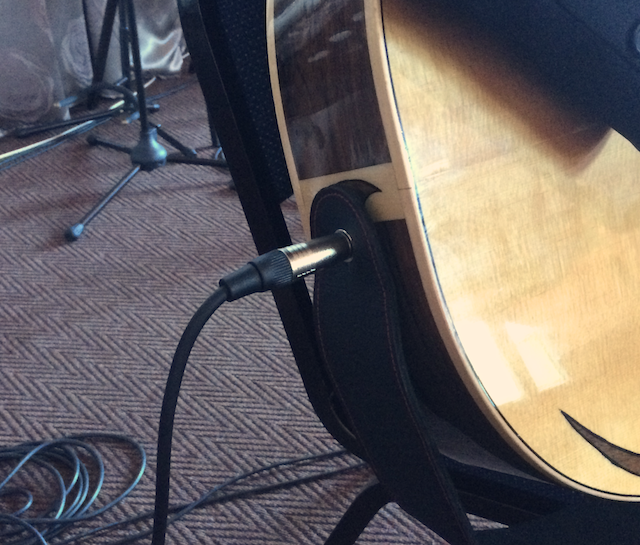 If you place the microphone very close to the guitar (6 inches) the bass will be emphasised. If you place the microphone at 6 inches to 2 feet away the sound will be more natural. The further away you move the microphone the thinner the sound will become and you run a higher risk of getting more unwanted noise in the recording.